You want to chop a rectangle up into smaller rectangles (at least 2 of them, probably more) so that all the pieces have equal areas. This much is easy: just cut it into congruent rectangles as if you were cutting up a rectangular birthday cake. But the problem asks for more: the perimeters of all the pieces should be different. 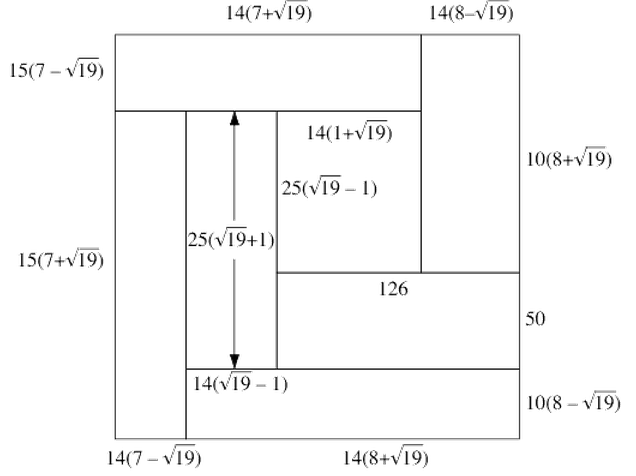 Actually there is a way to do this, shown in the figure, but there the perimeters are pretty complicated numbers involving lots of square roots. Is there a way to do this so that the perimeters are all integers (whole numbers)?